Wedding makeup is not the ordinary makeup and demands few important things to be taken care of! It is a reality that a good wedding makeup can make any bride look like the most beautiful woman of the world while a little carelessness or wrong makeup stroke can simply destroy the look of the bride and can give her a disastrous look! So whether you are planning to do the makeup yourself or hiring a professional wedding makeup artist for your much awaited wedding day, here are the top 10 tips that will give you the desired bridal look. Hire best professionals and discuss your priorities – If you follow this tip, you won't have to worry about the other tips! This is so because the wedding makeup artist will take care of everything for you! The only thing you need to do is to choose the best makeup professionals and discuss your own makeup preferences with them. For example, you can tell them your choices of wedding hair and makeup. You can show up your desire to get natural wedding makeup and so on. You can even show your bridal attire to the makeup professionals so that they pick makeup products which go well with your bridal silhouette. Use a good primer – The first step towards good wedding makeup looks includes the use of a primer. Choose a primer from a trusted brand. The primer is required because it prepares a base for your wedding makeup and ensures that it stays for a longer duration of time. A bride is demanded to look beautiful every moment and primer ensures that the makeup stays on her for a longer duration than usual. Choose products which are suitable for your skin – When your wedding is close by, do not start experimenting with the new products. Remember, using the new cosmetics can be risky as they may react to your sensitive skin or may cause some sort of allergy to. You do not want to look for home remedies while getting ready for your big day! Hence, stay safe by choosing cosmetics and products that you have been using for the last few years. Still, if you want to try a new product, discuss with the makeup expert and ensure that it is safe to use on your skin specifically. 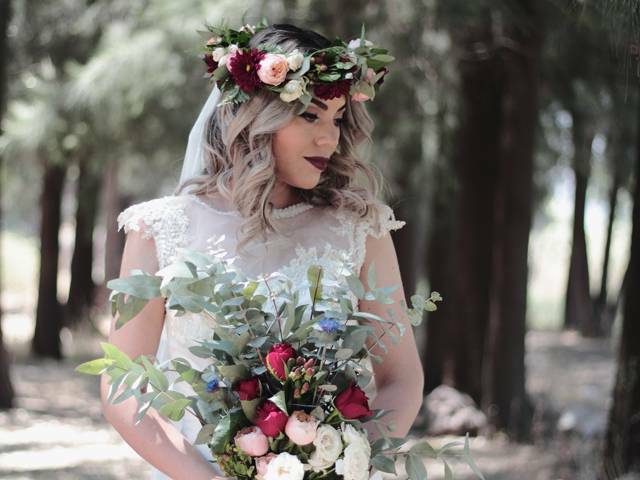 Use waterproof makeup products – When you wear your bridal dress, the scintillating jewelry and carry your bridal bouquet, the chances are that you may start sweating soon. Sweat can spoil your makeup and look. Hence, it is best to opt for waterproof makeup products that do not get spread on your face even when you sweat. Also, such waterproof cosmetics are best and reliable when the weather is humid or rainy. Use concealer to hide marks/blemishes – No wedding makeup ideas or tips can be complete without the use of concealer in them. We all love to take care of our skin and want to look our best on the wedding day. But a tiny pimple or a mark can annoy us with its presence just before the wedding. And this is where; the role of the concealer arrives! It helps cover up your marks and blemishes of facial skin in the most suitable way. You get a flawless look in just a few moments when you use a concealer. Go for airbrush makeup techniques – Gone are the days when brides used to carry that cakey-makeup look. Today, you do not need to pile up layers of foundation in order to get a radiant and fair-looking skin. You simply need to choose the airbrush makeup technique. In this technique, the makeup is done using a small airbrush gun. It spreads the specific cosmetic in the most desired manner by forming an even coat all over the face of the bride. 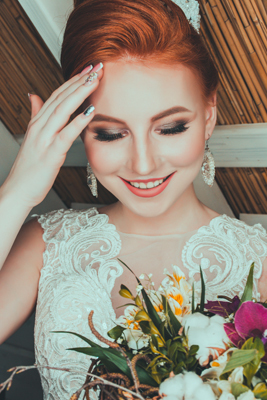 When the makeup is done through the airbrush technique, the bride can stay assured of achieving an even and natural looking wedding makeup. The use of false lashes, mascara and eyeliner – The wedding eye makeup is one of the most important parts of bridal makeup. Our eyes are the mirrors of our face, and thus, we need to define them in the right manner. Natural looking false lashes can do wonders for your eyes. These lashes will make your eyes look more alluring. You can complete the look with false lashes by adding good coats of mascara and eyeliner. The mascara will mix up the false lashes with your natural ones while eyeliner will help highlight your eyes in the required way. Make your lips look luscious – Generally, when you get ready for any party, you can simply fill your lips with colors, and you are ready to go! But the same is not the case when you are getting ready as the bride. You need to define your lips properly so that they look fuller and luscious than usual. To achieve such lips, begin your lip makeup by applying a gentle lip crème. This will help soften them. Then, use the lip liner to create an outline for your lips. This will not only ease the task of filling lipstick but will also give you that desired pout look. A bit of shimmer in face makeup – Whether it is about Indian wedding makeup or wedding makeup of some other origin, the wedding makeup ideas always include the role of few glittering elements. The use of shimmer adds the spirit of freshness and festivity in the bridal look. However, make sure that the shimmer has to be used only at occasional places. Some women get a ridiculous look by spreading the shimmer all over their face. This is not how shimmer is used! Well, the shimmer has to be used gently on the corners of eyelids and a bit on the cheekbones. The shimmer should not be used anywhere else on the face. Use a good quality makeup setting spray – Once the bride has achieved a perfectly coated skin and has well defined her lips, eyes, and cheeks; it is now time to lock the wedding makeup. To lock the bridal makeup, few makeup setting sprays are easily available in the market. This lets the wedding makeup stay intact. We hope and believe that the above wedding makeup tips from our favourite fabulive.com makeup experts will help you get the best bridal looks!